On August 18, after I cleared multiple TSA security checks, a Delta pilot refused to allow me to board a flight. On Saturday, August 18, 2012, Delta Airlines gave in to the fears of bigots and refused to let me board a flight out of Buffalo-Niagara Airport. What follows is my 3,000-ish word reflection on what happened. A shorter version, with tweets, can be seen via Storify here. I was then questioned by TSA about the significance and meaning of the shirt. I politely explained that it was “mocking the security theater charade and over-reactions to terrorism by the general public — both of which we're seeing right now, ironically.” The agents inquired as to the meaning of the term “ZOMG” and who it was that I thought was “gonna kill us all.” As best I could tell, they seemed to find my explanation that I didn’t think anyone would be killing us all and that I was poking fun at overwrought, irrational fears exhibited by certain members of the flying public to be satisfactory. And moreover, they clearly deemed my shirt to be no legitimate threat. The Delta supervisor then told me I would be able to board the plane, but only after acquiescing to an additional security check of my and my wife's belongings and changing my shirt. He went to lengths to explain that my choice of attire was inappropriate and had caused serious consternation amongst multiple individuals, and that ultimately “It's not you, it's the shirt.” We would then be the very last two people to board the plane, no doubt drawing additional ire of my fellow passengers. Despite what I saw as my right to wear a shirt that expresses my feelings about our Kabuki Security Theater, and a fairly ridiculous over-response to the matter (I had, after all, worn the same shirt at least the last five times I’d flown without any incident whatsoever), I agreed to the stipulations set forth by the Delta supervisor. Soon afterwards, once the boarding process had commenced, the Delta supervisor pulled me aside again — this time accompanied by not only three TSA agents, but also multiple Niagara Frontier Transportation Authority transit police. I was questioned some more and my wife was also pulled out of line for additional questioning and screening. Our bags were searched, my shirt was photographed, we were asked multiple questions about the cause of our visit, how often we make it to western NY, and our drivers’ license numbers were taken and radioed in for what seemed to be a quick background check. At this point, the TSA agents appeared satisfied we had nothing suspicious in our luggage and that we posed no threat. However, the Delta supervisor informed us the pilot had decided, regardless of the outcome of the multiple TSA screenings and my willingness to change shirts, that due to the discomfort my shirt has caused, my wife and I would not be allowed to board the aircraft. Passengers on the plane supposedly felt uncomfortable with my very presence on the flight. And the Delta manager went out of his way to point out that he wholeheartedly agreed with the pilot’s decision. I was stunned. “You’re f------ kidding me,” I said in response. I pushed for an explanation of why the pilot was willing to overrule/ignore the judgment of the trained security officers. “Why can’t I board? What’s the concern?,” I asked. Wow. Let’s just consider that for a moment. In short, security screenings and any other evidence-based assessment method have been deemed irrelevant. Whatever I do, I am suspicious. Why? Not because the shirt I’m wearing presents some sort of legitimate threat. Not because I have weapons or potential bomb-making tools in my luggage. And not because I’ve shown any other indication of any sort that I’m a potential terrorist. Rather, the pilot and some Delta rep can project upon me their worst fears of what I am possibly capable of. If that’s the case, why even bother with the bloated security apparatus — since Delta pilots have discretion to kick off passengers who've passed multiple checks, after all? Though I suppose I see where they’re coming from: my 120 pound frame on my 6’2” body is very, very intimidating. Given the fact that I’d already exhibited a sense of sarcasm and willingness to question authority, it’s certainly no leap in logic to expect I’d combine that unacceptable uppityness of mine with my brute strength to single-handedly takeover the plane mid-flight. You know, with mind bullets. Oh yeah, seems completely reasonable to me. And so long as we’re just coming up with completely unjustified imaginary scenarios about what other passengers might do, let me give that a hand, too. As I posted to Twitter: “Using my imagination, I'm afraid the racist dingdongs flying @Delta will attack me mid-flight. Will @Delta pilot refuse to let them fly?” Of course, using my imagination about the threat posed by white passengers just doesn't carry the same weight with Delta as irrational fear-mongering of white bigots — Delta apparently takes pride in catering to their irrationality. But why? If racist dingdongs are made uncomfortable by my presence on flight, shouldn't Delta ask them to change flights rather than kick me off? 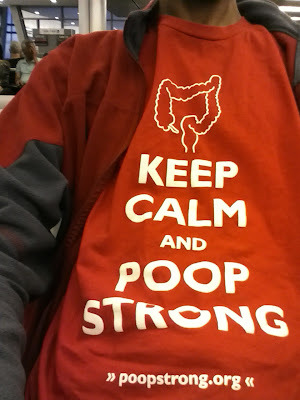 If any passengers were still afraid of me sans my “upsetting t-shirt,” Delta should see no reason to accommodate them. These are not voices that warrant being appeased. If my presence makes them uncomfortable, they can choose to be on a different flight. But instead Delta explicitly accepted the argument based in pure irrationality, and then went one step further by justifying their own actions by appealing to the powers of the imagination. Absolutely disgusting, appalling behavior. Not offending the sensibilities of racist passengers who get offended by being forced to travel alongside people of color shouldn't be Delta's goal. No one wins when we tolerate and accommodate such odious behavior. Delta should be willing to recognize the civil rights of all their paying passengers over certain passengers’ “right” to be fearful of Scary Brown Men. Or rather, those who want to be afraid of me and what they fear I may do can go ahead and live and fly in fear, but the last thing Delta or any other airline should do is validate these noxious beliefs. Now, our hellish travel experience wasn’t quite over just yet. Having been booted from our flight, the transit police now began to aggressively question us. At one point, I was asked where my brother lives (he was the one who gifted me the shirt). A bit surprised by the irrelevant question, I paused for a moment before answering. This response did not please her partner, a transit cop named Mark. Mark grabbed his walkie-talkie and alerted his supervisor and proceeded to request that he be granted permission to question me further in a private room. His justification? : “First he hesitated, then he gave a stupid answer.” Michigan, my friends, is a stupid answer. Fortunately, Mark’s request was denied. Apparently, someone at NFTA recognized this bigoted meathead for the bigoted meathead he was and that nationality is simply a concept that exists solely on paper and cannot be discerned from just looking at someone. But Mark wasn’t quite done harassing us. He didn’t get his way with me in a private screening room, but he had some other tricks up his sleeve. He left in a huff, declaring he be back with the dogs. Meanwhile, the questioning from the other transit cops continued. As did the questioning on completely irrelevant topics, too. In the world of NFTA transit police, women are the chattel of their husbands. And to indicate such, they must take their husbands' names! My wife's unwillingness to give in to this convention is clearly a sign of my swarthy suspicious character. How dare I marry a feminist! The fact that she refuses to define herself by her relation to me is un-American! Soon, Mark returned. And he had the dog he promised he’d be bringing. Was there any reason to suspect we were carrying drugs? Of course not. Was this anything more than some lunk who was pissed off to see his authority questioned and who chose to respond by trying to intimidate us? Of course not. The dog turned up nothing and our good friend Mark left again. Shortly thereafter, the latest round of questioning was now complete. When Mark returned, he conferred with his fellow transit cops. They found out that I had opted out of the body scanner at the TSA security checkpoint. Mark cited this piece of information to his fellow cops as further evidence of my suspicious nature. Now if Mark had even the slightest clue how to do his job, he could have asked me directly about why I opted out. But that would’ve been too much work. It’s a whole lot easier to make baseless accusations. Had he asked me, this is what he would’ve learned: I’ve been undergoing treatment for stage IV colon cancer since February 2011. In addition to having little tolerance for unnecessary and ineffective security procedures like the body scanner, I’m also not particularly fond of exposing my body to additional avoidable sources or radiation and, more importantly, any scan would guarantee that I receive a follow-up full-body pat-down. Why? Because I have both an implanted port through which I receive my chemotherapy infusion and, having lost nearly a foot of my sigmoid colon, I have a colostomy. A bag that full of some sort of foreign matter strapped to the abdomen of a passenger would raise eyebrows among those analyzing the image of me walking through a scanner. Since I’d be selected for additional screening anyway, why go through the scanner when I can just avoid that altogether and go straight to the secondary screening? But it really shouldn’t matter what my reason for opting out. The key is in that word “opt.” It means I, like any other flyer, have an option. I can choose to avoid the scanner. And in doing so, I shouldn’t be seen as admitting any sort of guilt. Eventually, the Delta manager returned to inform us we had been rebooked on a flight the following morning at 7 am. But Delta didn't find it necessary to give us a place to stay for the night. Instead, we had to rent a car and drive to my in-laws’ place, some one-and-a-half hours away. We arrived some time around 10 pm and we were off again by 3:45 am to ensure we'd be able to make it to our morning flight after returning the rental car. So very kind of Delta to make this experience even more miserable. In any case, we arrived the following morning, August 19, and I was wearing a different shirt. Was the word “poop” going to be deemed too offensive for flight, too? Perhaps those who want to preserve the status quo in which insurers can kick people off insurance for being “too expensive” and be denied coverage for having a pre-existing condition would find my shirt upsetting? Perhaps an Aetna shareholder, already upset over the fact that the company was publicly shamed into paying my $118K+ in medical bills, would see my shirt, realize who I was, and would be unwilling to fly alongside a known enemy of God’s Very Own Free Market? Would Delta acquiesce to those complaints, as well? It turned out Delta had a different plans to screw with me. While my wife was assigned a seat when we checked in, I was instead simply given a piece of paper saying I was “confirmed” in lieu of an actual boarding pass. And being “confirmed” didn't actually mean would necessarily ever be getting on that plane. With the flight oversold, my only hope was that eight passengers would accept Delta’s offer of a voucher and take a later flight. Luckily, Delta convinced enough people to take the voucher, so I wasn't involuntarily re-booked yet again. Given the threat I supposedly posed the previous night and the extent to which I made people uncomfortable even without my shirt, it's interesting how things ended up working out for the flights we finally took to return us to Phoenix: I ended up being assigned a bulkhead seat with extra leg room on the first flight and didn’t have to pay the extra surcharge for it and got an exit row for the second flight, likewise without paying additional for that privilege. So, fortunately, we did make it home without too much trouble (aside from the worries regarding whether we'd actually get seats) the morning after we had intended to get home. There are certainly some reasonable questions one can ask of this entire incident. As a friend asked via Twitter: where should we draw the line when it comes to what people can and can’t say in airports and what counts as “crying fire in a theater” territory? The distinction I would make is the same one that was made by the Supreme Court in Cohen vs. California (h/t Matthew Davis for reminding me of this case in a comment on my Storify account of this incident). In that case, the majority of justices were willing to distinguish between speech and conduct. I was doing nothing more than wearing a shirt that poked fun at our national willingness to give up our freedoms in the face of fear. 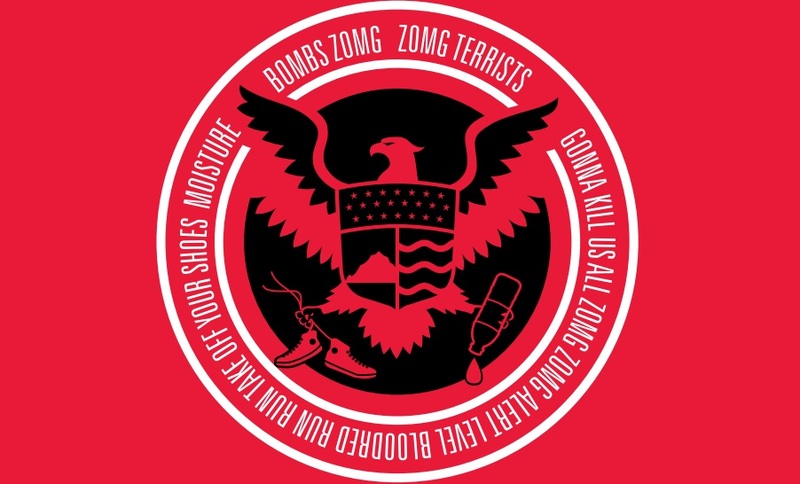 A satirical t-shirt doesn’t constitute a threat, and the TSA officers who interrogated me conceded as much. My shirt was speech, not conduct. So, what now? Well, fortunately we can all complain. Loudly. And to everyone. There are multiple actors who acted wrongfully in this case, and all should be called out and officially reprimanded for doing so. There are multiple avenues through which we can air our grievances regarding this situation. Write to Delta, their CEO, to the Niagara Frontier Transportation Authority Transit Police, and to the feds who are in charge of ensuring that passengers do not have their civil rights violated. Demand justice. Maintaining the safety of the flying public should not mean the abrogation of civil rights of dark-skinned passengers. We value customer feedback and appreciate you taking the time to contact our Chief Executive Officer of Delta Air Lines, Richard Anderson. We understand your feelings surrounding this issue and we are grateful you took the time to let us know how our actions have been perceived. We are privileged to serve thousands of customers around the world every day. Delta does not discriminate nor do we condone discrimination against any passenger regardless of age, race, nationality, religion, sexual orientation or gender. At the same time, providing a safe and secure operation is Delta's primary and most fundamental obligation to our customers and employees. Your concerns have been reported to the appropriate leadership for their internal review. Safety and security will always be our first priority and most fundamental obligation. Delta doesn't discriminate or condone discrimination of any kind against our employees or customers. Delta spokesperson Betsy Talton told MailOnline that the airline does not discriminate against any of its passengers.